Well it’s a tough life, but someone’s got to do it! My niece came into town on her way around the World. Very proud of her for taking such a step and was brilliant to see her. We took a day to just tool around in the Atom. It was an absolute blast. We took the Atom through my local Canyons down to Topanga Canyon Road. This is one of the nicest drives around as it winds its way through a Canyon from “The Valley” through to Malibu. We stopped off at the Malibu Inn for excellent wings and some (non-alcoholic) beverages. We followed the magnificent Pacific Coast Highway all the way down through the ribbon of Malibu and onwards down to Santa Monica. As you can see, the weather was SoCal perfect. I did spare a thought for fellow Atom owners not quite so blessed with the conditions to go cruise the Atom pretty much at will without looking like Captain Birdseye or a World War 1 Pilot. As always, the Atom got a ton of attention and comments. What I really like is that I never hear anything negative. It’s always “that’s how to roll”, “great car dude”, etc. It really does add to the fun and enjoyment as I’m a really positive person and there is a hell of a lot of negativity generally on SoCal roads. It’s a blast just tooling around with no particular place to go and apparently the car does something to brighten the day of others too – very cool. 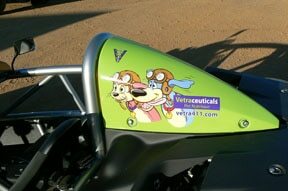 The Vetraceuticals wrap I had added to the spare body panels also gets a ton of attention. Simply driving the Atom has built my business significantly, with people looking for the formulas for their dogs and cats as well as people wanting to join the business asking for info from me and actually signing up because they’d seen the car. Again – very, very cool. What was a cruise with my niece was also actually then a day’s work! No bitching from me about working conditions, that’s for certain! From Santa Monica, we cruised along Sunset Boulevard and made a right on Rodeo Drive in Beverly Hills. I have to say, this rural Brit felt quite at home in an Ariel Atom, passing by Van Cleef, Armani and all! I always figured that at some point someone would hail me and say “hey – you’re just who we need for our ‘before shots'”. The funny thing is that the tourist were taking pictures of the Atom. I would love to see their faces when they blow up the pics and realise it wasn’t a “celeb” – not even “E List”! I really would love to know where some of the pics that are taken of the car end up. If you’ve by chance stumbled in to this blog and have a pic, let me know where you took it. A bike pulled up next to me on Rodeo and we had a great chat. Small moments of hammering as there are more Cops per square mile in 90210 than anywhere else on earth. He was quite shocked at the get up and go but did best me by doing a “stoppie” – not something I can pull off unless I have some serious brake bias adjustment! Out of Beverly Hills, back up through West Hollywood and then home – sadly via freeways – as we were getting late. An absolutely great day out. Thanks to my niece for giving me a legitimate reason to spend the day tooling around in the car. I forget how nice some parts of the area are that I live as I get caught up in the “day to day”. It was nice to “smell the roses” for a day, along with all the other smells that you get in the Atom! Time to get serious next week – It will be her first track day! Will report back after I’ve changed my trousers!